He never could’ve imagined this. As an undrafted free agent out of Saint Mary’s College competing for a roster spot on a lousy-at-best Cleveland Cavaliers team, Matthew Dellavedova could only have dreamed of playing a huge role on that very same team now headed the NBA Finals. But through all the ups and downs of his career, from midseason trade rumors to starting at point guard in the Eastern Conference finals, one thing has always defined Dellavedova. You see, Dellavedova wouldn’t be where he is today, heck, he probably wouldn’t even be on an NBA roster if it wasn’t for the tough, scrappy play that everyone suddenly seems to regard as criminal. We’ve all seen the NBA get softer and shy away from the violence and aggression that once defined it over the past two decades, but is this really what it’s come to? After Al Horford’s ejection from Game 3, the general consensus seemed to shift toward the “Delly is a dirty player” bandwagon. “You can see from the baseline view that he’s pulling my left arm down,” Dellavedova added. When looking at the replays, you can clearly see Horford’s left hand grabbing Dellavedova’s arm just above his bicep and yanking him to the floor. In addition you can see DeMarre Carroll fall to the floor beneath Delly’s feet, essentially setting up one of those “tabletops” that we all used to get our friends with at recess. But the media seems to be spinning this incident around, referencing Delly’s “track record” as a dirty player to insinuate that he was trying to cut Horford’s legs out from underneath him. It isn’t the first time that Delly has successfully managed to push someone from the opposition over the edge, they say. The incident that upsets most people was his leg-lock of Chicago’s Taj Gibson, which drew a swift kick from Gibson and resulted in his ejection from the game. That play was as close to dirty as you’ll ever see Dellavedova play, and even then, it’s more gamesmanship than it is playing dirty. 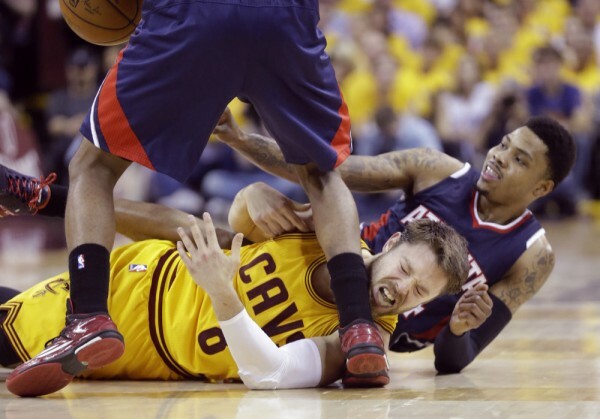 And I’m not even going to dignify the ridiculous notion that Dellavedova was trying to hurt Kyle Korver when diving for a loose ball on the floor in Game 2. Stop it. He just does whatever it takes to show up for his teammates. He always has. But we have to be able to draw a line somewhere, as the media, as fans of the game. Just because someone is good at getting under an opponent’s skin, that doesn’t make them a dirty player. It makes them a smart player, a grinder, an I’m-gonna-do-whatever-it-takes-to-win player. People only have a problem with guys like that when they’re on the other team. Dellavedova is a pest to his opponents, no doubt. But why, all of the sudden, is that such a bad thing? Bradley Beal named Dellavedova his most difficult defender in a 2014 interview with SLAM magazine. Kyrie Irving had multiple spats with Delly early in his career, some even nearly turning physical, before a mutual respect replaced the disdain that once stood between them. And that’s it, he’s playing hard. In practice, in scrimmages, in off-season workouts, there is no such thing as taking a day off for Matthew Dellavedova, he’s always working. But there is a distinct line between playing hard and playing dirty, and quite honestly, Delly rarely even skirts that line. He will box out with a vengeance, he will hit the floor for every loose ball — but he would never do anything to try and injure anybody on the court. I can see how his opponents would find themselves irritated by him and his game, but this attack on Dellavedova’s character as a basketball player seems more like Atlanta’s sour-puss response to getting steamrolled from the outset than it does a legitimate complaint. And that’s not the only play that the Cavaliers took exception to. LeBron made it clear in the postgame press conference after Game 3 that he did not appreciate the narrative surrounding Dellavedova’s play. James also referenced the “brotherhood” and “NBA family” that exists within the league, but said that you can never remove that aggressive nature from the game, especially during the postseason. At the end of the day, James and the Cavaliers know what they have in Dellavedova and they’re just glad he’s sporting their colors. Next Story → Could LeBron James and Dwyane Wade Be Reunited in Cleveland?